Herniated Disc in Neck - Identify the signs and help prevent it! A herniated disc in the neck, known medically as a ‘cervical herniated disc’ occurs when the center of a disc in the neck ‘herniates’- that is gets dislodged and or leaks out from it’s proper position. Pain occurs when it presses on or irritates an adjacent nerve root. When your disc is herniated at the level of C5/6 it may impinge or pinch a nerve in your neck. If it does you may also get symptoms in your arm. Your head may feel too heavy for your neck. It is one of the more common conditions we treat at my Physiotherapy Clinic. 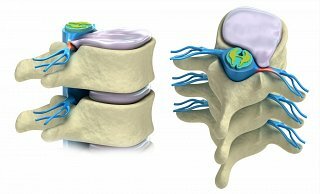 I have another article that goes into further detail on this, but here I want to focus on understanding how a cervical herniated disc commonly occurs, because only then can we get to treating it and preventing it from occurring again. Identify the symptoms before they occur! A client who sits for long periods of time, (e.g. 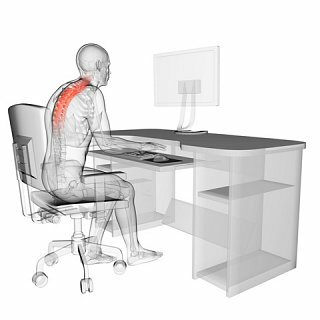 at a desk job or driving), presents for treatment with a herniated disc. The common history I hear is that they have ongoing “niggles of pain” in their neck and shoulder for months - if not years - after a long day at their desk. They ignored the niggle until now as it usually recovered with a good nights sleep. Eventually, however, recovery does not occur overnight and it gradually, or sometimes suddenly, worsens to the point of not being able to sit anymore due to pain. It is only then that they decide to seek help!! A full disc herniation can typically take up to 10 sessions with a Chartered Physiotherapist to resolve fully, possibly 2-3 weeks out of work and a lot of pain! What I find is that Clients who listen to the early signs of their disc-related neck pain, and come to a physiotherapist at an earlier time it would have meant elimination of pain in days and probably 2-3 sessions in total. The message is: - Listen to your body before it blows! Poor neck posture related to disc injuries usually involves a chin poked posture. This is typical of a computer worker who sits in a slouched lower back position and then pokes their chin forwards to see the computer screen (see computer posture and back pain). This posture is one example where the mid to lower part of your neck is placed under too much pressure resulting in the C5/6 disc section of your neck anatomy becoming strained - and eventually herniation is possible. Let me tell you about Mike who came to me with severe neck pain recently. Mike had a three day history of right-sided neck and arm pain. On a pain scale of 0-10 Mike rated his current neck pain at 8 to 9! He told me that he had been suffering with right sided neck ache intermittently over the previous three months. He was an accountant and when he was working long hours at his computer he would often complain of neck pain. In its early stages it recovered after a night’s rest and usually returned towards the end of the following working day. Prior to this severe injury he had noticed that his neck pain was not recovering overnight, but that it had not been severe enough to go to his doctor. He tried home remedies such as heat but it had minimal effect. At this stage his pain level was 3/10. Then, one day he was at his desk. He turned suddenly to respond to somebody and his neck went into spasm and the severe pain started. He then went to his doctor who prescribed medication to ease his pain. Although the medication eased his pain to 6/10, he was unable to work or function in any way. A week later he returned to his doctor who organised an MRI scan. The result of this was a disc lesion at his C5/C6 vertebral level which was pressing on a nerve in his neck causing arm pain. He was then referred to me! On assessment, I found that Mike had a severe restriction of neck and arm movement limited by pain. All my physiotherapy findings were consistent with a disc lesion. I treated Mike daily for a week and his arm pain was relieved in full over that time. I continued to treat Mike twice weekly until his neck pain was fully resolved. This took a further three weeks. He was then in a position to stop all medications at this stage and he continued to manage well. Being self-employed, Mike had to return to work at this stage and I advised him on the correct posture and set up of his working space. I also advised him to get up from his desk every 20 minutes to break the postural position he was holding. Although he was managing well he continued to report neckache intermittently during the day. Two weeks later Mike was back to full function but I have advised him on the permanent changes that he needs to make to ensure no re-occurrence of his symptoms. He has started Pilates exercises, although he finds it difficult to find the time for his regular exercises, I have told him if he doesn’t conform his disc may become a problem again. I expect he will continue to improve. His overall posture and working methods have changed for the better significantly! Well done Mike! I am of the opinion that the cause of Mike’s disc herniation was as a result of poor posture. If he had responded to his early stages of neck ache and seen a therapist he may have prevented the severe pain he suffered. Never ignore your body’s signals as early intervention is always the best way!